No one is an island, but Apple often thinks so: it treats nearly all its products except the Mac as if only one person might ever use them, from the iPhone to the Apple TV to the new HomePod. However, it is possible to share certain purchases using Family Sharing, or even to copy songs and other material across Macs and iOS devices. In the latter case, however, you can wind up being routinely prompted for the password to an account at which an app, song, or other licensed material was purchased. This happened to Macworld reader Ron, whose sister-in-law years ago sent him a song that he dropped into his library. Now he gets a daily prompts to log into her account on his iPhone! He wonders if there’s any way to find and delete that song. Unfortunately, Apple lacks any tool to search for the party that purchased a song. 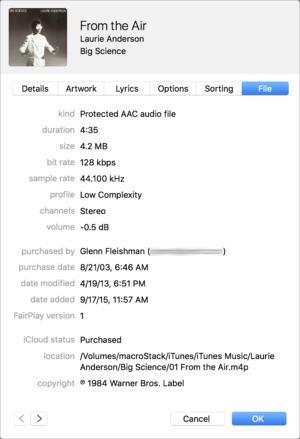 But you can see which songs have purchase information embedded in them via iTunes in macOS—just one at a time. In iTunes, choose New > Smart Playlist. In the line below Match Music, select Purchased from the first popup menu and Is True appears in the second popup menu. Click the plus sign at far right. Click OK and name the playlist. A smart playlist can help you find an errant song. The Song Info view’s File tab reveals purchaser information. Under Purchased By (if that metadata appears), you should see the name and purchase date. Another option that requires a little less effort is to go to the Songs view, choose View > Show View Options, and check the box for Purchase Date. Now you can click the Purchase Date column that appears to scroll through items in order of purchase date. If it’s a major problem for you and you’re willing to pay the princely sum of $1.99, you can try out and then purchase this tool from Doug’s AppleScripts for iTunes, Track Down Purchases. It’s great if you have a lot of different commingled purchases.